Well at least this one will be longer than the Croft report. I will also look at some of the more controversial moments that I may have got myself involved in. I entered the race at the last second, and at that stage the engine wasn’t actually back together again! We’ve used bits from the new engine that was nearly built up – but that means we have a few mis-matched bits and had to go with a ‘safe’ setting with lower compression and other compromises. We were up at 4am and made the start of qualifying, though! For once it didn’t start raining as the Vee’s lined up to go out – in fact the sun scorched down all weekend. I had to ease the engine in so was taking it easy to get my mandatory three laps in, and these were also my first laps in the car for six months (I think we can discount two sodden laps at Coombe). And on the restart it came. Dave Wallis had lost it at Clearways, and with James Clennell left unsighted behind another car, he ploughed into him. I didn’t like the look of Clennells car – a lot of chassis deformity, but thankfully he and Dave were both able to walk away. Dave commented to me that if that was in the sidecar he’d raced last year, that might not have been the case for anyone involved… Which is why I chose to race with four wheels instead of two! My car had been smoking, and we found a fixable oil leak. The engine seemed ok but not particularly sharp, but I found that getting back on the throttle to turn into Paddock Hill I got nothing. I described it as a flat-spot in the rev range that we can probably attribute to the new heads not being delicately tuned to the length of the carb manifolds. Solution for the race? Either drop it to third gear (risking high revs), or go into the corner a lot faster in fourth gear. So only one option, then! I made a great start and blasted through a few rows. This is where things can get a bit awkward, especially if you’re trying to keep out of trouble, as you’re now right in the thick of the first corner bottleneck, and if you make a great start you can be around cars that will lap much faster. I backed off more than I normally would and lost a few places into Druids. Things settled and I was in about a seven car group, although I was towards the back still feeling things out with my car. Everyone around me was racing hard but fair, and despite the number of us swapping and changing, I think we all trusted each other not to do anything daft. This is where you get some great racing, and you’re also not slowing each other up. I let what seemed to be the entire field plus half the Locust grid up the inside of me into Druids as I was focusing a bit too much on keeping it safe. Then Bill Garner starting dropping all of his oil over the track. My visor (oh, that reminds me you’re still waiting for my report on my anti-fog modifications – stay tuned for that!) was covered and it was like a wake coming out the back of the car. Rory Melia was ahead of me when Bill overtook him going into Paddock Hill, and I could see as soon as Rory hit the brakes he lost it on the oil. I thought I could ease on the brakes and nip up the inside before he spun, but the instant I touched my brakes the back end swung around like I was on ice. I stood on the brakes to lock everything up, but I was travelling directly backwards and all I could see in both of my mirrors was Rory directly in my path. I let off the brakes a little to get some steering back and managed to get some angle so I didn’t clatter into him, and as a bonus still stayed out of the gravel trap. Alex Jones had an interesting view of this as he was directly behind us, and we part to let him through the middle just in time. Tom Roper wasn’t quite so lucky, but managed to slam on his brakes to avoid me, now almost stationary in front of him as he came over the blind crest. I wasn’t getting any lights from my dashboard to restart, so let the car roll down the hill and tried to bump start it, but even this was to no avail. Finally, just as I hit the rise up to Druids I tried the starter again and it fired in a cloud of black smoke, and I blasted off to chase down Vaughn Jones in his Spider. To spice things up, at least one other car was also dumping all their oil onto the track. I remember for a few laps there were three distinct lines of oil through Surtees – the flat-out left hander – and you basically had to pick one of them and see if you could hold on! I caught Vaughn as I neared Druids, and just caught a glimpse of the leaders right behind me (what happened to the blue flags??). I let Daniel Hands**? and Graham Gant through up the inside, taking a wide line in, and seeing Graham seriously sideways on oil and headed for the tyres (well held, that man! ), decided to cut back for a late apex. I overtook Vaughn down the Cooper Straight and then still managed to stay stupidly wide, risking putting myself off and losing the position I’d just made to allow another two leaders to have the inside line into Surtees, all of us sliding three wide on the oil. I don’t think some of the faster cars realise just how much effort we put into getting out of their way, and we often get sarcastic comments about “not looking in your mirrors”. Sometimes what they actually want is for you to disappear, but we still have to turn into the corner at some point as well, and if you’re so great a driver why do you expect us to be able to use less track than you? Remember that the MSA rules tell you to stick to your normal racing line and it’s up to the car behind to find a safe way past you – imagine if we all just stuck to this? Then we’d see some proper moaning. I crossed the line a sorry 20th with the engine sounding awful. Speaking to Glenn we were ready to just put it on the trailer and take it home, rather than risk more engine damage, but he decided to have a look at compression readings. This was down to what we expected, but a fair bit lower on two cylinders – still not really enough to explain the problem, though, so he checked the valve clearances as a last hope. We found one had become very tight, and one very loose, so after a quick adjustment that seemed a likely culprit. We headed to the Kentagon for a meal and some banter with the other drivers, and were happy to give it a crack for the next day. 2017 was the most open year of the championship for quite a few years. To pull no punches with that statement, the main reason was Paul Smith leaving Vee after dominating the series for years. This attracted several former champions and front-runners back to the series Daniel Hands, and inspired the other front-runners like Ben Miloudi, Ian Jordan etc to step up and try to grab their chance. Undoubtedly, some of the strongest competitors were either a bit rusty, only did part seasons, or had reliability issues – and with eventual winner Ben Miloudi not defending his crown and very strong runners like Adam Macauly moving his attention back to the Irish scene, 2018 will be even more of a free-for-all! I’d say there are at least eight drivers likely to win the championship – and that’s without the usual surprise of a rookie jumping in at the front or one of the existing drivers stepping up to challenge the front runners. I think Class B will be even tougher this year. James Harridge could be the first to take A and B class together – which is both good and bad. It’s bad that all us other Class B runners are clearly in a different league to the likes of him so we have no chance of ever beating him on track unless he has problems. This means we don’t get any trophies, but then from his point of view why win one trophy when you can win two? The good thing is that if this does happen – and if not this year then it’s only a matter of time – it might make the organisers make some changes to make A and B class more distinct, and bring it back to the original ethos of B class being cheaper, having older and less technically advanced cars, and/or more inexperienced drivers. And I’m not having a whinge here, because if new rules came in that excluded me from B Class I’d be totally fine with that. As it stands, though, I’m one of the serious contenders in B, and although I’ll be starting off with a less than perfect car there is another engine on the cards along with new tyres and a few other improvements to come later in the year. Jamie Harrison has moved to the Bears team in a new car and will undoubtedly be the one to beat other than Harridge, and I suspect Andrew Cooper will be very quick again this year (if he’s coming back? ), as well as Jack Wilkinson if he does a full season. Colin Gregory will be in Adam Macaulays car and I doubt that will slow him down too much, but I’m not sure if he’ll run that to B spec or move to Class A.
Ross Price also showed he could mix it at the front in B without much experience, so he’ll be another serious threat. And the joy of Class B means you’re even more likely to see absolutely anyone, old or new, suddenly click and be up the front! 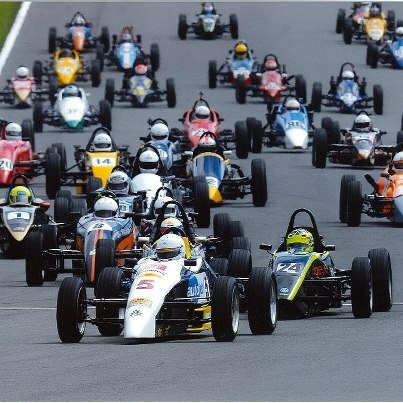 We have a couple of new tracks to most of us – Castle Coombe to start with and then the Snetterton 200 circuit at the end of the year, and then Mondello Park for all those travelling to Ireland for a chance to try some International craic. Me? I still hate Brands so will be trying to break out of that this year, and hopefully Silverstone will be kind ot me for the first time ever. If I have mildly better luck than last year it would be nice, and I will definitely be looking to *puts on a European accent* push very ‘ard. I know both the car and myself are capable of more, so let’s see if I can unlock it! Hope to see you all out there, and let’s have a safe, clean but hard fought 2018 season! ***On a side note, you may have seen that I’m doing a charity parachute jump on 5th May – please click the link and throw a few ponds my way for this! It’s for a great cause and massive thanks to those of you who have already given! Sponsor me here for Primrose Hospice!